In time order then, let’s start with the ‘Past’: Thanks to everyone who attended the recent DSRA open meeting in the CLR James Library. The meeting was kept short, as requested, but, I believe, successfully conveyed to all present where the DSRA currently stands and what we have been working on. Of particular interest was the subject of our service/management charges, which we hope to have further news on very soon as Consort complete the budgets for past years as well as the 2014/15 financial year. A report on the meeting is now available for download from the DSRA specific section of our Forum HERE (if this link does not work for you, read the first post in THIS THREAD). And while on the subjects of our forum, Consort, and budgets, at Consort’s request I have published a copy of the letter they recently sent out to all owners (there has been an issue with sending out this letter so if you are an owner but have not received it, a little patience should see new copies sent out very soon. Failing that, read it on our forum HERE). Though mostly of interest just to owners, the first paragraph includes news relevant to all Dalston Square residents: For those still unaware, Sean Stone, Consort’s on-site development manager, has left Consort and been replaced by Mr. Gerald Bernard. Obviously Gerald is going to need a little time to settle in and get to know the place (and it’s issues), but if needed he can be contacted on 020 7249 0896, or by email at gerald.bernard@consortpm.co.uk. Moving now into the ‘Present’, we have the ongoing issue of the flooding of the sub-basement beneath phase 3 buildings, and more specifically Sledge Tower. After many emails back and forth between DSRA Chair Ben Collins, Consort, and Barratt, it seems we have finally got the the crux of the issue. It seems this is pretty much the last part of the Square yet to be handed over to Consort because of the issues of flooding in this sub-basement. This flooding has been an issue right from the early stages of construction and Barratt have a number of engineers looking at the problem, trying to find a way to rectify it. This problem only recently came to residents attention when a sewer blockage forced raw sewage into the already flooded sub-basement. Anyhow, Barratt have now pumped this area dry (and have committed to keeping it dry until a solution to the flooding has been put in place), and have instructed Consort to go ahead and have the whole area sanitized to remove the last of the residues and with them, hopefully, the last of the odours. Consort have advised us that this work will be undertaken next week, and will take a full 5 days to complete. If after next week anyone again smells a problem, do not hesitate in contacting either Consort or Barratt (phone numbers and email addresses are in the side-bar of our website homepage). And finally the ‘Futures’: Dalston Futures (the Hackney Unites project that aims to give the local Dalston community a voice in what happens in/to Dalston). They have just received a grant to make a short film allowing local people to voice their concerns, and they want to hear what yours are. If you would like to be heard, or have experience in film making and can offer advise/help, check out all the details HERE. That’s all for now, have a great weekend neighbours! Firstly, we now have a venue and an agenda for this coming Thursday’s DSRA ‘Open Meeting’. The venue is to be the CLR James Library (just ask at the library reception and they will be able to point you to the meeting room), and the agenda can be seen on the flyer at the foot of this post (click the thumbnail image to see it full size). As I mentioned in my last post, of particular interest at this time is Consort’s budget for our service/maintenance charges for the 2014/15 financial year. Members of our financial committee will be present at the meeting to report back on their meeting with Consort last week where that budget was presented to us: The news is not good. On the 11th October last year I published a post (HERE) advising of a survey Hackney Council was running in order to gauge opinion on the subject of making Dalston an SPA (special policy area). This is used to control last night licensing in areas where a large number of such licenses already exist (if you followed the link I posted in the comments beneath that post, HERE, there was a very sound argument against such a carte blanche policy). Well, in a recent council meeting the council decided to go ahead with the plan. For further reading on the subject, HERE are details on the council’s own website, and two very good reports that give some extra info and interesting stats can be found HERE (Hackney Citizen) and HERE (East London Lines). Lastly, updates on the two new restaurants that will soon be opening in the Square. First to open will be Nancy’s Pantry (in the space that was once the Barratt sales office): Currently scheduled to open their doors at 10am on Sunday 9th February. This is a restaurant that will be focusing on children and the family so is well placed in a development the size of Dalston Square. Check out their Facebook page HERE to be teased with pictures of items from their menu. Not too far behind them, though I do not yet have a date, will be Le Ziz (in the space below the gym in Gaumont Tower). Their website is still under construction and I do not yet have a great deal of details but what I can tell you is this: It will be a Mediterranean and Anatolian ‘fine dining’ restaurant, with a designated lounge area with a more relaxed atmosphere. They have also said that they will be holding a buffet/cocktail style launch event, just before their official opening, for residents of the Square: Very exciting. More news on that very soon. One last thing before I finish (whilst on the subject of Dalston Square Businesses), are you aware of ‘The Mayor of Hackney’s Business Awards’? These are annual awards given out to Hackney businesses and business people in various categories. One of these categories is the Peoples Choice Award, and here the winner is voted for, from a shortlist, by the public. And would you believe that two of the list of 30 businesses belong to Dalston Square residents: Fiona ‘Fee’ Eastwood’s ‘Fee Fee La Fou‘ on Bradbury Street, and husband and wife team Murat & Melek Erdal’s ‘Cafe Route‘ right here on the Square. Unfortunately you can only vote once so this could be a toughie, but please do vote and support your neighbours. DSRA ‘Open’ Meeting – Thursday 6th February, 6.30pm to 8pm. Venue to be advised. Consort’s 2014/15 budget proposal: As owner’s costs rise, so do rents, so this is not just an owner’s issue. We will have feed-back from our finance committee on their recent meeting with Consort. The news is unlikely to be good. Sean Stone’s replacement as Development Manager: As Consort and Barratt go through the motions of hiring, the DSRA is keen to be involved in the process. This also makes it a good time for us to assess how we feel about Consort’s ‘on site’ performance generally, and ask if changes are needed. Outstanding buildings and maintenance issues: With final completion of the Square very close to hand there are still issues that need addressing before Barratt pack up and leave for good. What are the issues and how best do we ensure they are dealt with. I will post again before the day of the meeting to publicise the venue. Until then, please keep that Thursday free and show your support by turning out for a couple of hours: If the Square is your home, we would love to hear your opinions. Now to the ‘Plus’ part of the post. Hackney Unites are in the process of organising their next ‘Dalston Futures’ community meeting but in the meantime have co-sponsored an event with campaign group HOPE not hate. The event, to be held in the Arcola Theatre (ignore the Dalston Lane address if you click through to them – the venue has changed) on Feb 17th, will be an introduction to, as well as a masterclass in, community organising. Their full explanation of the event can be found HERE. It is expected that this will be oversubscribed so, to reserve your spot, check HERE. My apologies all, the meeting is NOT in the Library after all. It is instead to be held in Gaumont Tower. Simply visit the concierge team and they will direct you to the appropriate apartment. Sorry for any confusion. Just a quick reminder of the meeting taking place on Wednesday at 6pm in the library. You all know the routine by now: The meeting is open to all residents of the Square, owners and renters alike. See you there? Click the image below to see it full size. We have been contacted by Hackney Unites, the organisation that put on the Dalston People’s Festival earlier in the year. Following on from that success, they are to hold an open meeting, at 6.30pm on 17th October at the Trinity Centre on Beechwood Road, to discuss the future of our neighbourhood. More specifically, they are looking to create a permanent, inclusive, community organisation in Dalston that is capable of identifying its collective needs and organising to ensure that decision-makers cannot ignore the community. This can only be a good thing, and is surely something residents of the Square need to support and be involved in. For full details of the meeting and how to attend/participate/get involved, follow THIS LINK. 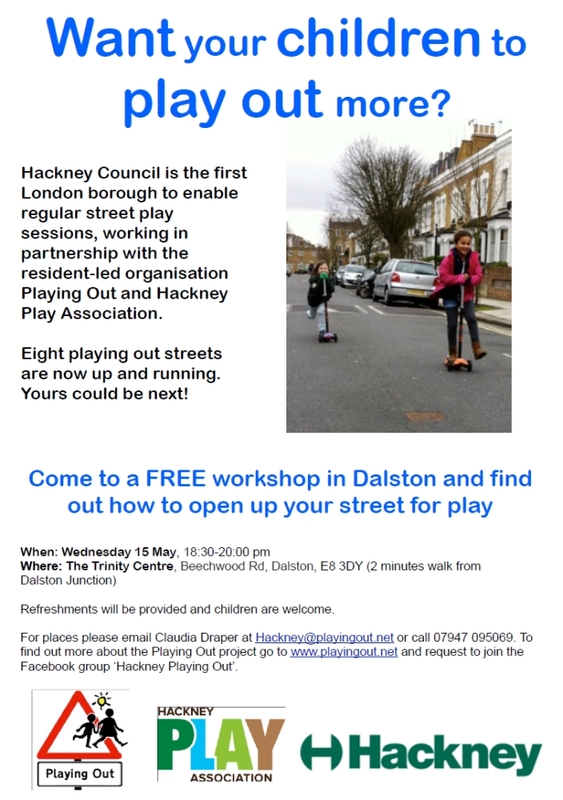 Following the link will also give you access to a survey they are conducting that they are asking all Dalston residents to complete. It will only take a few minutes so please do give it a go. Think you may attend the meeting? 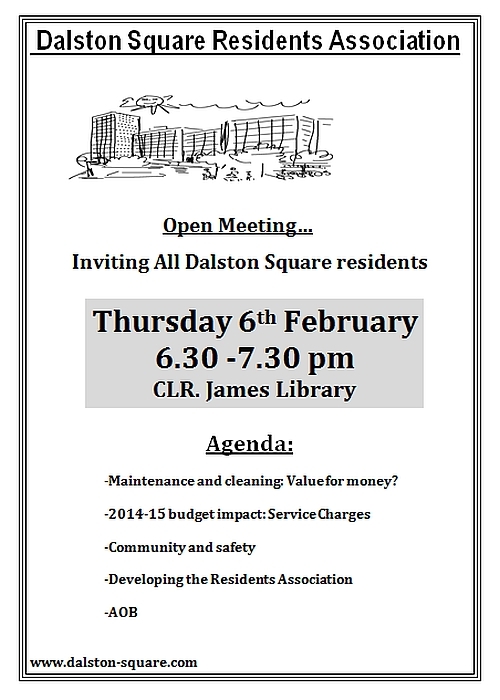 Feel able to represent the Dalston Square Residents’ Association? If you can attend the meeting, takes notes, and report back to Ben Collins, chair of the DSRA, please drop him a line at bmcengland@aol.com. streets for play in their area. kind as to publicize it to your residents and members. 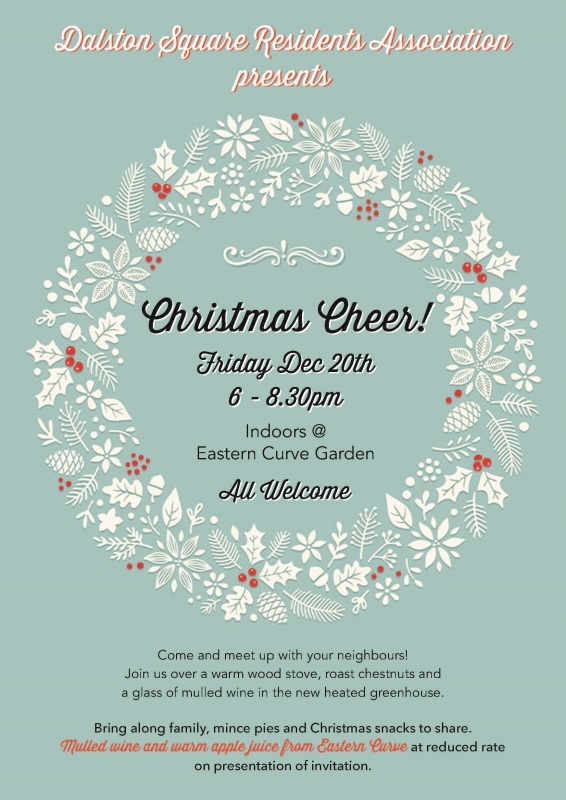 For further details check out their poster below (click on it to see it full-size). 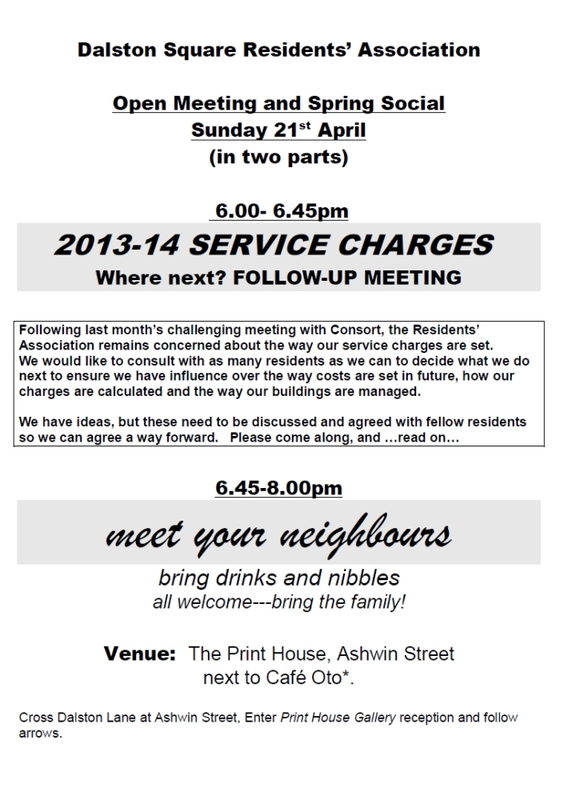 As many of you will know, at the disastrous meeting held by Consort in the library a few weeks back (a meeting at which Consort failed miserably to justify the latest proposed increases in our service charges), they promised to get back to us by mid April with answers to our many questions. Mid April is, but for a couple of days, now upon us and we have heard nothing (though in fairness we have also not received the latest bill which should have been with us by now). Where do we go from here? Ben Collins (DSRA Chair) has been weighing up our options and has come across a couple of very interesting organisations: The Federation of Private Residents’ Associations (FPRA – www.fpra.org.uk), and the Leasehold Advisory Service (a government funded Non Departmental Public Body – www.lease-advice.org). The former, a not-for-profit organisation who offer legal and organisational advice to it’s members (we would have to pay a membership fee to join in order to receive this advice) work very closely with the second and are very familiar with Consort and the problems we are encountering. I think you would agree it is perhaps time to take our grievances to the next level and see if this may be the way forward. In this regard then, we will like to call a meeting, open to all residents of Dalston Square, leaseholders and Tenants alike, to discuss these and other options and decide on a way forward. Hoping this will not take that long (we have scheduled 45 minutes for the meeting), we thought we could then break out the drinks and nibbles and have a bit of a Spring get-together: Nothing overly long or fancy, just a chance to have a chat and get to know each other a little better. Click on the thumbnail below for all the details. Hope to see you all there: The meeting is important and we need your input!